This old hotel is located in the heart of the French Quarter in Jackson Square. 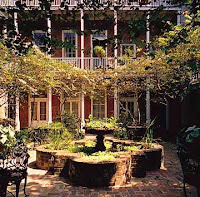 It is made up of 8 townhomes with 85 rooms that all surround a pretty courtyard with lovely magnolia and crepe myrtle trees. This courtyard also has a pool and a lovely fountain. The Place d’ Armes was built in 1725 and is a good example of 18th-century architecture. The guests that stay here enjoy wonderful views of the Quarter including St. Louis Cathedral. The site where the hotel sits was once a school in New Orleans. In the Great New Orleans Fire of 1788, most of this school was destroyed, killing the school’s headmaster and several students. The ghosts that haunt the buildings are said to be victims of this fire. Many claim they still roam the halls of this hotel. Guests report hearing the sound of footsteps, voices, and laughter is often heard above their rooms. Furniture is moved around in unoccupied rooms and music without an identifiable source is reported. Two apparitions that interact with the guests include a young girl and an old man. The young girl, seen dressed in old-fashioned clothes, asks guests where her grandmother is and then vanishes into thin air. The ghost of an old man has a beard. He also wears 18th-century clothing. He is said to nod at the guests politely and like the young ghost then just disappears. People who have not experienced any of this paranormal activity for themselves still state the Place d’ Armes has a definite otherworldly feel to it. 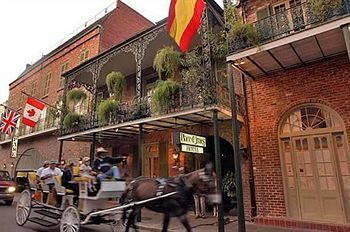 For years it has been considered one of New Orleans “most haunted.” Many of the haunted tours through the Quarter include at stop at the Place d’ Armes. Is the Crying Boy Painting Cursed?